My sixteenth ground of 2015 was on Saturday 12th September at Liberty Way in Nuneaton, Warwickshire. 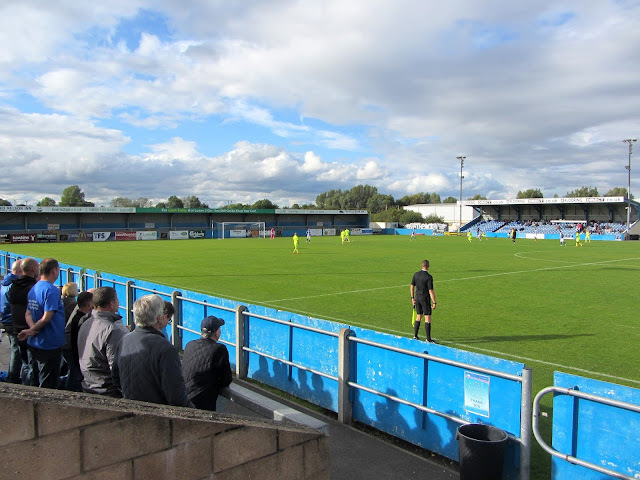 The match was Nuneaton Town vs. Gainsborough Trinity in National League North. Liberty Way is in the midst of the Attleborough Fields industrial estate in the south-east corner of the town around 1.5 miles from Nuneaton railway station. The club moved to the venue in 2007 ending an 88 year stay at their Manor Park ground. All the seating areas are on the north-east side of the ground. The main stand contains 514 seats and rests on the nothern side of the half-way line. There are offices and a TV gantry next to this with the dugouts in front of these. On the southern side of the half-way line there is a wooden structure for corporate clients which contains a small amount of additional seating at the front. The opposite side of the pitch consists of uncovered standing with two concrete terraces taking up most of this side of the ground. 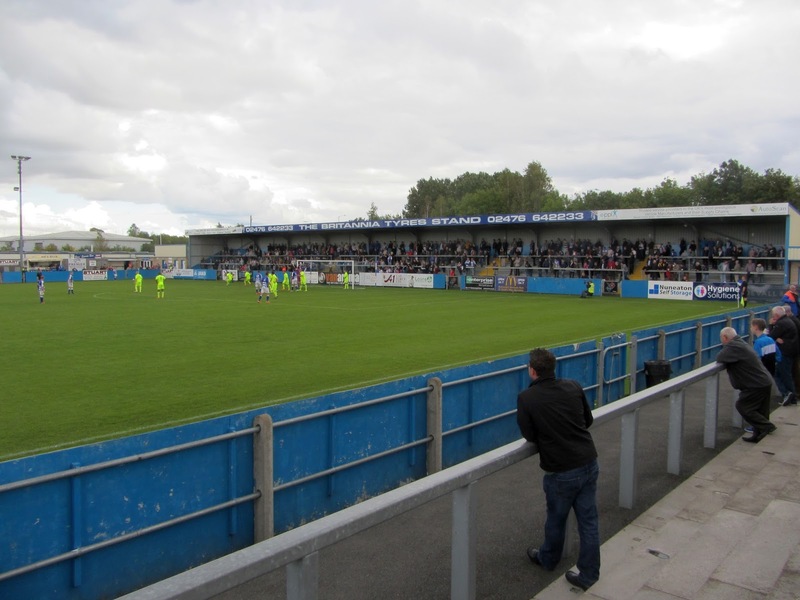 Behind these terraces is a building for Nuneaton Rugby Club which also shares the ground as it rents the venue from the football club. 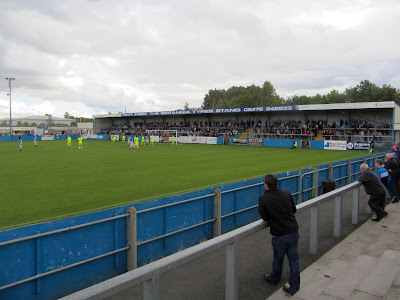 The areas behind the two goals are taken up by covered terracing with the stand behind the southern goal being the larger of the two. 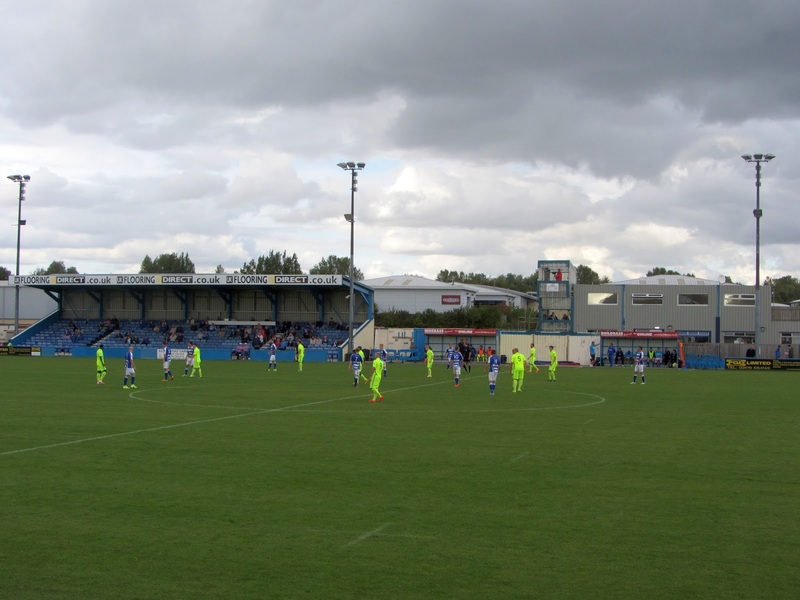 Nuneaton edged the first part of the game and took the lead in the 36th minute. A Gainsborough free-kick broke to Elliot Whitehouse who played a ball over the top of the defence to Aaron Williams who raced clear to slot past the keeper. The home side began the 2nd half strongly with concerted pressure on away box and on the hour mark they made the breakthrough. The ball was laid off to Shane Byrne on the edge of the box and his deflected shot wrong-footed Jan Budtz in the Gainsborough goal. Nuneaton dominated the rest of the game and Gainsborough could count themselves a little fortunate to have only lost by two.